Jinxy Knows Best: 57% Off A Custom Enjoy Life Foods Gluten-Free Variety Pack - Only $19 SHIPPED! 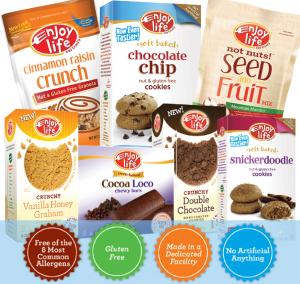 57% Off A Custom Enjoy Life Foods Gluten-Free Variety Pack - Only $19 SHIPPED! Enjoy Life offers delicious gluten-free snack foods that are also free from the eight most common allergens: wheat, dairy, peanuts, tree nuts, eggs, soy, fish and shellfish. Plus, Enjoy Life is certified by the Gluten Free Certification Organization (GFCO) and their products are made in a dedicated nut-free and certified gluten-free facility. Right now you can pay only $19 to receive seven full-size boxes of tasty gluten-free snack foods from Enjoy Life - a $44 value. Shipping is included! ORDER HERE.